?This year?s The Devil Wears Prada? (New York Post)? from a former magazine publishing insider. Inspired by her own experiences behind the scenes, Sally Koslow wryly ?pokes at corporate greed, celeb worship, and the search for Mr. Right? (People)? At 37, Magnolia Gold (nee Maggie Goldfarb of Fargo, North Dakota) is the youngest editor-inchief ever to wield a red pen at Lady magazine. And with her loyal staff, parties, and Manolos, she no longer feels out of place. Enter Bebe Blake, loudmouth television personality and Fashion Don?t. To Magnolia?s horror, her boss has not only given her job to Bebe, he?s also turning Lady into Bebe. And Magnolia will be relegated to a roach-infested back office. Now she?ll just have to watch as her beloved mag turns rag. With Bebe all over the cover. In bike shorts? Sally Koslow, who was born and raised in Fargo, North Dakota, is the former editor in chief of McCall’s magazine. Married and the mother of two sons, she lives in New York City. 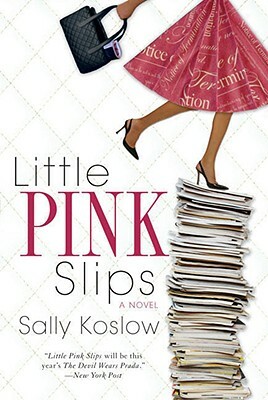 Little Pink Slips is her first novel.